This entry was posted in Commodification of women, cultural violence, Decapitation, Domestic Violence Homicide, Fatal male violence against women, Femicide, Golf Tees, Headless Woman, Male violence against women, misogyny, Patriarchy and tagged #domestic violence homicide, #femicide, #feminism, #male violence, #male violence against women, #patriarchy, decapitation, dunlop, golf tees, misogyny, Violence against women. Bookmark the permalink. ← Nahid Al-Manea was stabbed to death ‘because she was wearing traditional Muslim dress’? Thank-god for you&what you’re doing here re: ‘headless-women’. In 2007, i lived in Archway, London (i live in Highbury now) and a neighbour across the road from me, Ms Penny Manzonozzi, was brutally-murdered by her partner. She’d smoked his ‘crack-cocaine’ whilst he was out; when he got home, he slashed her throat, chopped her head-off, then dragged her into the front-room and re-assembled her across his lap &sat there. Until a neighbour saw the blood sprayed on Penny’s front-door &called the cops. The boyfriend claimed he’d come-home&found Penny dead; but there were only his footprints in all the blood-pools, so forensics weren’t-really neccessary. I heard Penny scream at 3am on day she died. The boyfriend had slashed at her when she opened the door&before the breadknife stopped-her, she screamed thrice. I went to the Old Bailey as an ‘ear-witness’ &my account tallied with her time of death. The boyfriend got life min. of 12yrs to serve; but, so i’m told, if you do arson or chop anyone’s head-off, the authorities tend to keep you in jail or a mental-hospital for life. But you should do more investigations and go further back than 2012: you’re on to-something here. I’ll help, if you want? Or perhaps you’d like to meet-up&hear ‘Penny’s Story’ in full? Her death only made local-paper, and details only in court: i find that an injustice to her memory&an insult to all women: &i’m a bloke! I’m 54, a Liverpudlian, filmaker/actor/director/writer and a Registered Academic-Reader in Tudor History at the British Library, divorced, three older children, happy-enough&now disabled in mobility due to onset of genetic severe spinal stenosis, so time-enough to spare. I’m on ‘Twitter’ @adiskype if you want to ‘follow’ &DM me, or reply here on my email. I will be interested to help you all-round to publicise this devastating aspect of the abominable way women are treated in the U.K. &The World. It’s a gigantic-disgrace&something needs to change bigtime&now! 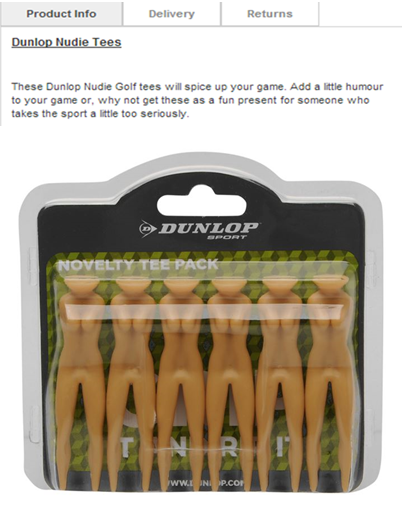 What yankeepoodle so clearly illustrates is the refusal to see the connection between the objectification of women, particularly ghastly to see in these golf tees, and violence against women. If someone cannot see that persistant dehumanising and commodification of girls/ women and our bodies in particular feeds and nurtures violent misogyny then yes, I guess they will think us insane. Like I give a s***! Well said, Karen. The classic response of the bully is, ‘It’s only a joke’. Well that’s constructive! Perhaps you have missed the point? Smh this is terrible, the violence must end. Yet another male owned corporate commercial company is profiting by creating a women-hating product for men to purchase. Said product is supposedly ‘humorous’ which is for men since the image does not depict a naked headless male!! Therefore Dunlop are not endorsing/promoting pandemic male hatred/male contempt for women because we women aren’t human are we??? But as we know promotion of mens’ lie that women aren’t human swiftly becomes mens’ truths because the Nazis realised dehumanising groups of women and men who did not conform to white male Nazi ideology is in a very short time accepted by society. Likewise when men fight other men they always dehumanise the ‘enemy’ because dehumanisation means the oppressors don’t have to even consider their opponents are human. Men however have never accepted women are human because men have always lied that women aren’t human. Dunlop haven’t created an ‘edgy/radical product’ instead they are profiting by promoting mens’ centuries old hatred and contempt for women because men claim only males are human and hence have right to dignity and respect. Men recognise when they have been disrespected and degraded but this right continues to be ‘male only’ because men continue to deny the fact females are human too and in fact form the majority of the human race. Men are in the minority but despite their minority status still cling on tightly to their male right to subject women and girls to pandemic male hatred and male contempt. I am disgusted by this culture of male violence this morning. Only this morning a man in a van cut me up with my children aboard, nearly forcing me off the road. At the traffic lights I wound down my window and challenged him. He laughed. Even seeing my children on board my car, whom he could have killed with his aggressive driving, he just laughed.